Registered in The Chinese Armorial, December 29, 2015. Arms: Quarterly, 1st: Argent a unicorn rampant of the field fimbriated Sable; 2nd: Gules four cinquefoils Argent arranged in two rows of two; 3rd: Gules a horseshoe ward upward Argent; 4th: Argent a panther rampant of the field fimbriated Sable. Private Registration: International Heraldic Registry, Netherlands, registration number SG2011L1988, December 19, 2011. Quarterly, 1st Argent a unicorn rampant Argent, 2nd Gules four cinquefoils Argent, 3rd Argent a horseshoe Argent, 4th Gules a panther rampant Argent. This blazon has two errors: firstly, the unicorn in the 1st quarter and the panther in the 4th quarter are both blazoned as white (Argent) on a white (Argent) field, so they would blend into the field and become invisible unless they are outlined or fimbriated in black. Secondly, the field of the 3rd quarter is blazoned as Argent (white), but it is actually Gules (red). The blazon used by The Chinese Armorial corrects these errors. The Chinese Armorial's blazon also defines the position of the four cinquefoils as in two rows of two and the position of the horseshoe as ward upward in accordance with the illustration. The armiger, Ms. LOW Yee Ling, lives in Singapore. Her coat of arms does not include a crest. Although the mantling is Gules and Argent (red and white), the International Heraldic Registry illustration shows some Sable (black) mantling over the topmost part of the helm; this is likely artistic license. 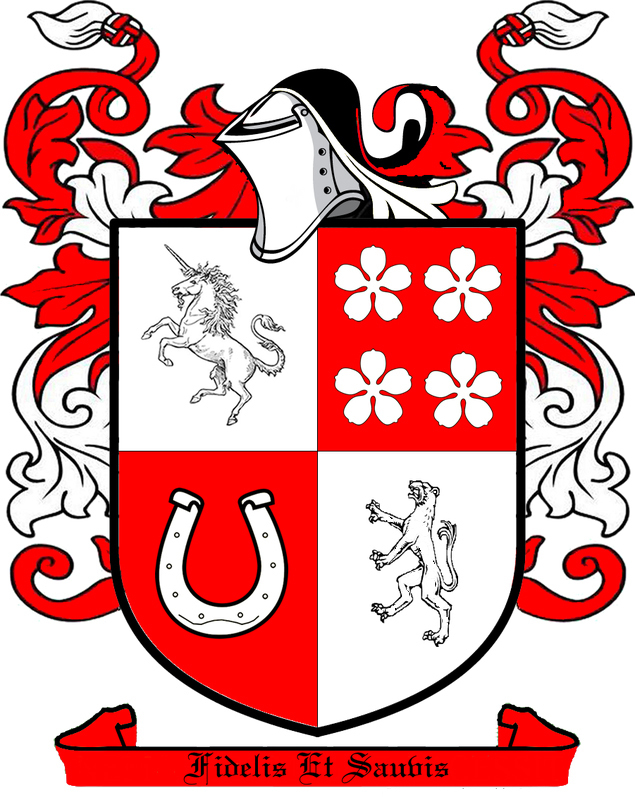 The unicorn represents the armiger's extreme courage, virtue, and strength in time of adversity and change. The cinquefoils represent the armiger's ever hopeful and joyful character. The horseshoe represents good luck and safeguards the armiger against evil spirits. The panther represents the armiger's beauty and fierceness but also her tenderness and love for her children. The horseshoe and panther both represent the Creator's blessings and wishes to the armiger.